An average of 11 million barrels of fuel were stolen per year between 2009 and 2015, with the amount soaring to higher levels last year. Since 2013, the Mexican government has implemented an ambitious program of reforms intended to open up and restructure the state-run oil company, Petróleos Mexicanos (Pemex). But the country is combating the persistent problem of fuel theft from Pemex pipelines and facilities, driven by intricate smuggling networks and corruption at the state oil company. 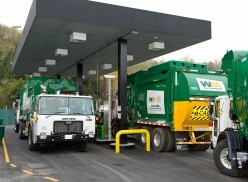 According to data obtained by The Fuse through AnimalPolitico—a Spanish-language news site that filed a freedom of information request with the Mexican government—an average of 11 million barrels of fuel were stolen per year between 2009 and 2015, with the amount soaring to higher levels last year. Eighty-one percent of stolen fuel was regular gasoline, which increased 50 percent to 14.2 million barrels in 2016. Regular gasoline is the most widely sold fuel in Mexico. Sales last year reached 53 percent of the total fuel consumption in the country. The stolen volumes create an acute problem for Mexico since it is short on domestic supply. 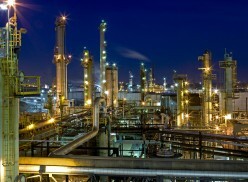 The United States exports large volumes of gasoline to Mexico because of the country’s chronic refining issues. The stolen volumes create an acute problem for Mexico since it is short on domestic supply. Data on oil theft is not typically reported by Pemex or the Mexican government. According to the Pemex data filed with the Securities and Exchange Commission, total pipeline taps increased 1,387 percent between 2009 and 2016 to 6,873. The amount of stolen gasoline represented 4.7 percent of the total sold in Mexico during 2016, up from three percent in 2010. Furthermore, fuel prices have significantly increased in Mexico in recent years. The price of regular gasoline, for instance, increased over 75 percent from 2010 to 2016. The upward trend in fuel theft, coupled with price increases, poses a serious challenge for Pemex and the Mexican government. 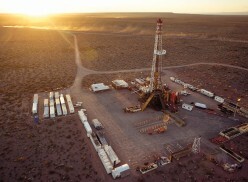 Mexico’s President Enrique Peña Nieto spearheaded constitutional changes in 2013 that would allow companies other than its NOC, Petróleos Mexicanos (Pemex), to conduct exploration, drilling, and importation of oil and gas for the first time since 1938. In recent years, Pemex has been under pressure from rating agencies to improve its financial stance. Moody’s downgraded Pemex’s rating one notch and gave it a negative outlook last year. 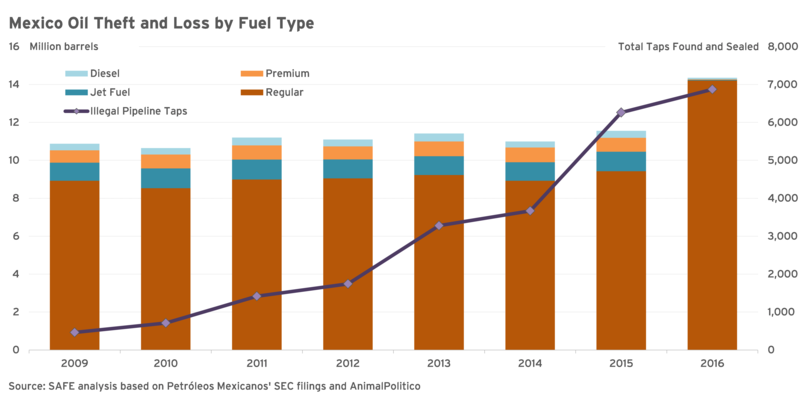 Although rating agencies cite low oil prices, cost controls, and tax burdens as the main drivers of the ratings, fuel theft could become a greater issue for Pemex if the increasing trend continues.